Disclaimer: The good folks at Kerrygold provided me with a copy of Coldagh’s Kitchen Diaries and coupons for their fantabulous butter. I highly recommend both. I have found a new outlet to get baked goods out of my house….it’s called daycare. Not that my coworkers have tired of being on the receiving end of what comes out of my kitchen. It’s just that it’s good to have options. And now that my daily activities include daycare drop-off and pick-up, I can spread the love (and the calories) around a little further. When The Mistah and I became parents, it was with less than 48 hours notice. So where most parents have nine months to plan, prepare, and make arrangement for life after a baby arrives, we were winging it. Our heads were still spinning at the idea of a baby as we swept through the aisles at Target and Babies R Us to get the stuff that we thought we might need. And even though the list of what you really need to bring a baby home can be rather short, those carts filled up pretty damn quickly. So the buying tons of stuff part of becoming parents got taken care of. And then we brought Lib home. And the taking care of a little person got underway. Which led to buying more stuff to take care of our little person. It went on like this for a while. And then one day, two and a half months had gone by and I needed to go back to work. It was only after we became parents that I had any understanding about how hard it is to get an infant into daycare. When you are able to estimate your child’s arrival in the world, you’ve got the luxury of time on your side. You can go to a daycare and get a spot in their infant program. When your family grows by +1 overnight, the stars need to align, the Universe needs to smile on you, and you need to make a wish upon a falling star to find a daycare center that has openings for an infant. And as if I needed further proof that the Universe was smiling on our adoption, we managed to do just that. Now our child is charming her way into the hearts of the folks at daycare, one day at a time. Seriously, she has her own fanclub at daycare…teachers from other classrooms come by to see her and say hello. As her parent, I want to make sure I acknowledge the people who spend their day caring for my child so that I can spend my day at work. And it never hurts to build a little goodwill for those days when my normally charming child chooses to be a devilish handful. If you find yourself hankering for a little mint chocolate fix, wanting to say say thank you, or maybe even apologizing in advance for something that your child may or may not do in the days to come, these cupcakes have your back. BAH Note: If you don’t have self rising flour in your pantry, you can substitute 1 cup all purpose flour + 1 1/2 teaspoons baking powder + 1/4 teaspoon salt. My cupcakes sank in the middle as they cooled….that could have been my doing or not….I just used the frosting to camouflage that and nobody was the wiser. Heat your oven to 350 degrees and line a muffin tin with 9 or 10 baking cups. In a medium bowl, whisk together the flour, baking powder, cocoa powder, and chocolate chips. In a separate bowl, cream the butter and sugar together until light and fluffy. Add the eggs one at a time, beating until thoroughly combined before adding the next one. Add the mint extract and then use a spatula to fold in the flour mixture until combined. Divide the batter among the baking cups and bake for 20 minutes, or until a tester inserted in the center of the cupcakes comes out clean. Cool in the muffin tin for 5 minutes before turning the cupcakes out and cooling completely on a rack. BAH Note: If you want a richer frosting, add up to an additional 1/2 stick butter. Taste the frosting and if you want a mintier flavor, add another 1/2 teaspoon extract. Combine butter and marshmallow in the work bowl of a stand mixer fitted with the paddle attachment. Beat on medium until completely smooth. Reduce speed to low and add confectioners sugar, mint extract, and salt. Continue to beat until smooth and fluffy. If using food color, add it a few drops at a time and mix until the color is distributed. Add more food color to get your desired shade of green. 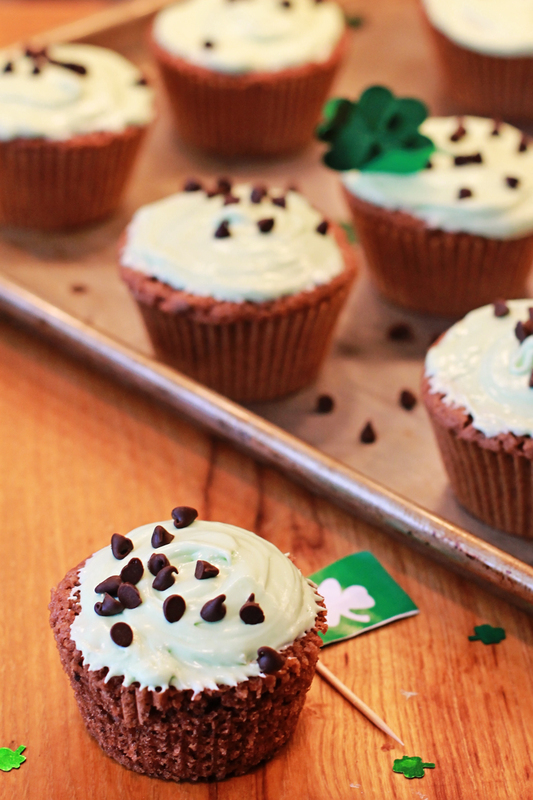 Frost your cupcakes, garnish with mini chocolate chips, and enjoy. dw loooooves the mint + chocolate combination. i am most interested in your marshmallow fluff icing. Marshmallow buttercream is heavenly.� And mint + chocolate is always the right answer. Didn’t think there could be anything that would improve the marshmallow buttercream. I was wrong. Oma, I forgot that you have already had the pleasure of meeting marshmallow buttercream. Hope you like this version just as much! We wouldn’t have had the presence of mind to think of half of what we needed if you hadn’t been there. So you see, the Universe knew I would need you in B’more that weekend and it lured you here with the promise of #crabcakecrawl and a #boxofwine. You give me too much credit. And as awesome & memorable as #crabcakecrawl was, now we know for sure we will never, ever forget that weekend! I’m gonna crave crab cakes every year on the munchkin’s birthday.